I've learned a lot from my decorator boss, heretofore referred to affectionately as Mugatu on my other blogs, but the man could write an entire book on mirrors. He does love a reflective surface (that's his bathroom)-for sparkle, for glamour, for contrast with rougher textures. And one of his pet peeves on the topic actually makes for a great decorating lesson: Never hang mirrors on the horizontal. I know it sounds like one of those arbitrary, potato/po- tah -to personal preferences, but I've conducted tests in every kind of room, with every style and size of mirror, and it always seems to ring true. Take a gander at this five-panel beveled mirror from Williams-Sonoma Home-it has a nice scale and is well-priced at $295. But somehow on the horizontal it looks low and stumpy and downright...homely. No, it's not just the wooden ducky. Hanging an oblong mirror (whether rectangular, oval, Baroque and swirly) brings the eye down and flattens the wall and the space. 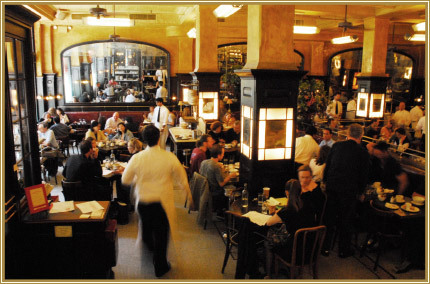 It's also more of a 20th century notion (think of the endless horizontal lines in Frank Lloyd Wright's work, or the Bauhaus school), and I'm more of a classicist, but I maintain that unless the expanse of mirror extends wall-to-wall like at Balthazar , you're better off going vertical, even if you have 8-foot ceilings. Bring the eye up! Fill the space on either side with framed drawings or small paintings. Still not convinced? I'll break out the scare tactics: Horizontal mirrors will make you look fat!